The chrome web browser is nowadays most popular.And many people use this.People who work with websites especially use google chrome.Because there are different extensions here.Also, large extensions are available for google chrome.It can be used more easily for your purposes.Let's take a look at five specific Extensions. Most of us use the google search engine.We usually do a Google search with a few words and get relevant search results.But we can get search results related to a photo given by the Google Image Search.For example, if you do not remember the name of a famous singer, you can upload his photo to images.google.com.All relevant information can be obtained.However, if you do not have a photo on your computer, you will need to download it online and return to the Google image searchSo it's troubling you.The Search by Image extensions are used as a solution.Once installed, this will add a camera icon to the bottom right of the images you see on the Internet.You can easily find more details about this photo by clicking on it. This is a special task.Here is where you open a new tab and show a google earth image.It displays a picture instead of the white background in google chrome.That picture is google earth photos.You also have the convenience of downloading if you like the images.Use the menu for that.You also have the opportunity to share the pictures. Many people use youtube, as well as listen to music.It also looks at music videos and does other things.So you can think you need the sound of the youtube video.Also, you need only the sound without the video.The best solution for this is the extensions.This saves the data for the video.Because only the sound of the videos is provided to you.By disabling it, you can use YouTube again with videos. It's a great way to get a screenshot of the web browser.And we can do a lot of things like dragging the crop in the screenshot, and so on.With the Awesome Screenshot extension, you can easily get a full photo, such as the one currently visible on the site, or the part you are choosing, in a complete website.You can also share the pictures. DVD Ripper software for Mac computer. 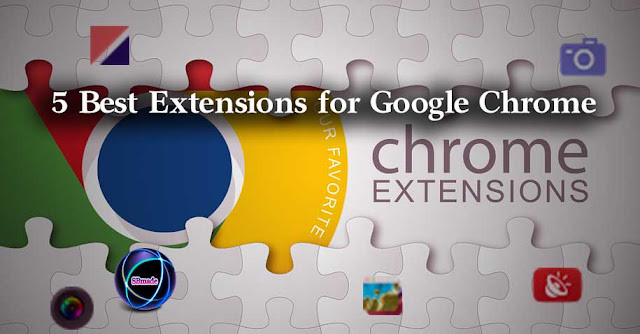 So you know about 5 best extensions for Google Chrome, Hope you like the post, don’t forget to share it with your friends and leave a comment below if you are facing any problem at any step in the method discussed above.Thank you. Life is like riding a bicycle.To keep your balance, you must keep moving. How to find Sinhala subtitles in any movie?